Last week, the Seattle Seahawks raised the 12th man flag atop the Space Needle; creating a powerful visual for an entire city to rally behind their winning team. Thanks to their Ustream broadcast, this special moment was not only shared by onlookers and the city of Seattle, but Seahawks fans around the world. 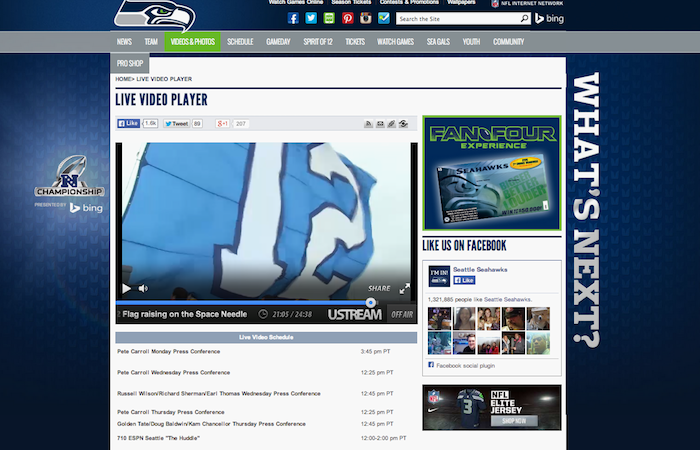 By harnessing the power of live, the Seahawks have initiated a hub for fans to connect and engage with their favorite team. We can’t guarantee a Super Bowl ring, but these helpful tips inspired by the Seahawks and other NFL teams will definitely help you win big in your broadcasts (insert end-zone dance here). At the beginning of the season, coach Pete Carroll hosted the 2nd Annual Seahawks Townhall live on Ustream, once again connecting with fans from a global stage with instantaneous interaction. The Seahawks were able to seamlessly embed their player right into their website, keeping accessibility very easy for fans to locate and engage in real time. All Ustream accounts allow you to embed your live channel player, a recorded video or highlight, or the player sidebar which includes the chat and social stream on your own site or blog. Ustream Pro Broadcasting accounts provide additional features around embedding, including restricting your live event exclusively to your site. The San Diego Chargers are another great example of an innovative fan-engaged franchise. Going live from press conferences, practices, and before games, San Diego keeps their broadcasts as professional as their team with Producer Pro. With Producer Pro, graphics, videos and music are all at your fingertips. Simply drag and drop any file from your computer into Producer for easy multimedia broadcasts. Want to learn more about Ustream can do for you?